When Democratic congressional candidate Anna Throne-Holst’s campaign manager, Andrew Grunwald, was asked whether he felt Hillary Clinton’s name at the top of the ballot was an asset or a liability, he declined to say for sure. Throne-Holst’s opponent for New York’s 1st Congressional District, incumbent representative Lee Zeldin, also has an arms length relationship with his party’s nominee. Zeldin, whose campaign did not return a request for comment, has no mention of Donald Trump’s name on his website. He gave the business magnate somewhat of a tepid endorsement after he won the Republican Party nomination in May. “Even though I don’t agree with Donald Trump on everything, and I think there may be certain things or statements of his that I may disagree with, he is a better candidate by far than Hillary Clinton,” Zeldin told Newsday. This is indicative of a new challenge some down-ballot campaigns might be tasked with this November, as both Trump and Clinton are unpopular among the American electorate. The Throne-Holst and Zeldin campaigns both appear to be carrying out a balancing act appeasing their party’s base, while also avoiding alienating independent voters who may not like either presidential nominee. The latest NBC News/Wall Street Journal poll says that Trump is viewed unfavorably by 61 percent of voters, compared to just 28 percent who view him favorably. Clinton is viewed almost as unfavorably, with a 52 percent unfavorable rating and 37 percent favorable rating. At the same time, dislike for each candidate is propelling both Trump and Clinton supporters. According to the same poll, 51 percent of Trump supporters say their primary goal is to stop Clinton, while 44 percent of Clinton voters say their primary goal is to stop Trump. 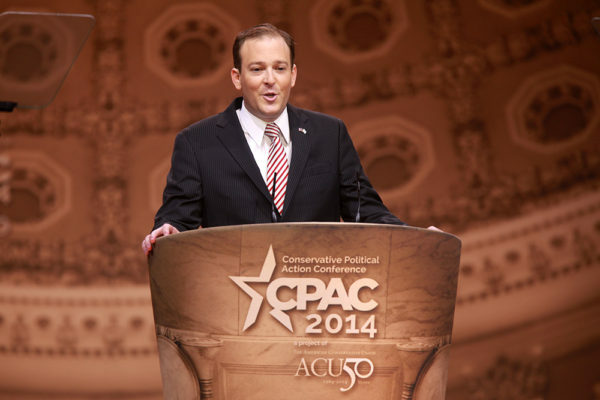 One political strategist actually thinks Zeldin stands more to gain from the top of the ballot. He also thinks that this election will come down to the way that moderate voters decide, including ones who may have voted for Zeldin in 2014 but may not necessarily support Trump. Democrats held the first district seat for 22 of the 28 years prior to Zeldin’s election. Democrats have narrowly won the district in four of the last six presidential elections, including the last two. Both the Trump and Clinton campaigns failed to respond to requests for comment on this story.